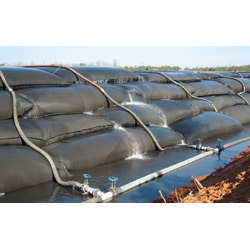 Geotube dewatering technology is a low-cost, high-volume dewatering solution. It is used around the world for containment and dewatering of industrial waste, municipal sludge and marine sediments. It can handle hundreds of thousands of gallons per day and offers dewatering and containment in a single operation. Geotube units are offered in a variety of sizes.